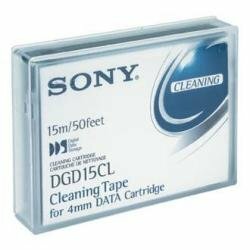 Sony 4MM DDS Cleaning Cartridge for DDS/DDS2/DDS3 Drives (Discontinued by Manufacturer) | Replicafer Co.
DDS packs up to 20GB into one tiny cartridge (DGD150P). This ability is derived from the helical scan technology developed by Sony. Long-term archival storage and a low error rate, Sony DDS tapes employ a magnetic material that has outstanding magnetic transfer characteristics. Key to this performance are Sonys ultra-fine particles and anti-oxidation coating, which is comprised of HDA (High-Density Alloy), HESA (High Energy Stabilized Alloy), and MP+++ (Metal Particle). DDS tapes are made with a non-magnetic layer above the base film to enhance the performance of the magnetic layer.